Designed for all those studying Italian who need maximum information in an accessible format, the Collins Pocket Italian to English and English to Italian Dictionary offers excellent, up-to-date coverage of today's Italian language, culture and usage right in your own pocket. This handy, durable format makes the Collins Pocket Dictionary ideal for use on the go, at home, at work, in the classroom or while travelling. With the most up-to-date words in both Italian and English, this is the perfect bilingual dictionary for GCSE exams, boosting students' test-taking ability and confidence. It also includes all the features you would expect from a Collins dictionary: an easy-to-read layout, special treatment of key words and an `Italian in Focus' supplement that helps you develop your fluency skills. This practical guide gives you information on pronunciation and how to use Italian in different situations, like sending an email or making a phone call, while also giving you insight into Italian life. 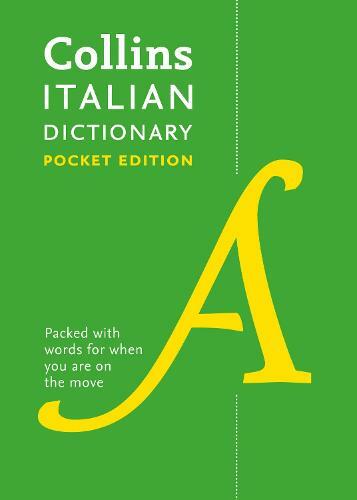 With 40,000 words and phrases and 60,000 translations, this Italian to English Pocket Dictionary is the perfect companion for all language learners. For more on Italian language usage, the Collins Italian Essential Dictionary (9780008270759) and Italian Gem Dictionary (9780008141851) are also available for purchase.